OMG! 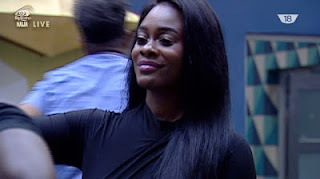 You need to see the look on that face...''back to sender'' was what she threw at Ebuka the host when asked whom she was gonna miss most, noting that it was same pattern Ebuka used on Ese the previous week who happened to be evicted eventually. She never believed it was her turn to be evicted, for real. Uriel had a strong personality in the house and most of all, her accent was the bomb. We welcome her back to Nigeria. Tags # #bbnaija # big brother naija # eviction show # see gobe # uriel # uriel evicted. Labels: #bbnaija, big brother naija, eviction show, see gobe, uriel, uriel evicted.